I don't often do requests, but just occasionally, if I'm feeling especially generous, I will consent to it. This hat was a request from my nephew. A hat with spots on was his wish. I quite liked the idea and as my sister was willing to supply the yarn, it was easy for me to say yes. 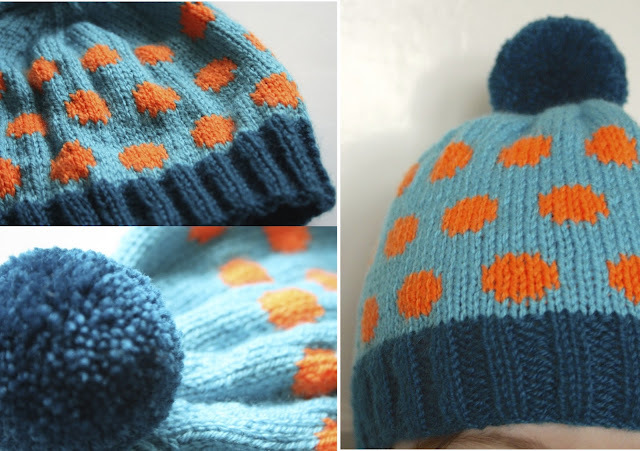 I found this pattern, Polka Dot Spots by Kate Oates after a quick search on Ravelry and it seemed to fit the bill nicely to me. Luckily my little recipient agreed with me. I confess to be quite frankly a little alarmed by the bright shade of orange presented to me as one of his 'favourite colours' along with a beautiful but also very vivid turquoise. The last of his preferred colours was a gorgeous, but equally bright green which I can't say made the most harmonious of colour palettes. My sister and I decided that the guiding hand of experience should step in to replace the green with a strong petrol blue/teal which, we persuaded this bright loving boy, would make a bold and beautiful combination. I think it does too. In fact, it works much better than I expected it too. I'd go as far as to say I'm quite in love with it. I'm also in love with the fact that my extremely rocky stranded knitting skills didn't let me down. Actually, this is by far the best stranded work I've ever done. It actually looks, well... neat! He didn't take it off the whole day when it was presented to him, so I think I'm safe in saying that I 'delivered the goods' as far as he's concerned. I think I also managed to make a 'Beautiful Thing for a Boy', no easy task in my book. So, satisfaction for me too! I love your hat and color combination. Have a great weekend hun. Beautiful hat - love the colors, so vibrant! Beautiful work! Lovin' the colors! Lucky nephew! Fab colour combo on a fab hat! That must have earnt you some Auntie bonus points! I think it looks great. It is quite hard to find handmade items for boys, or to make them yourself. I discovered Intasia knitting last Christmas and I am now in love with all forms of colour work like this! 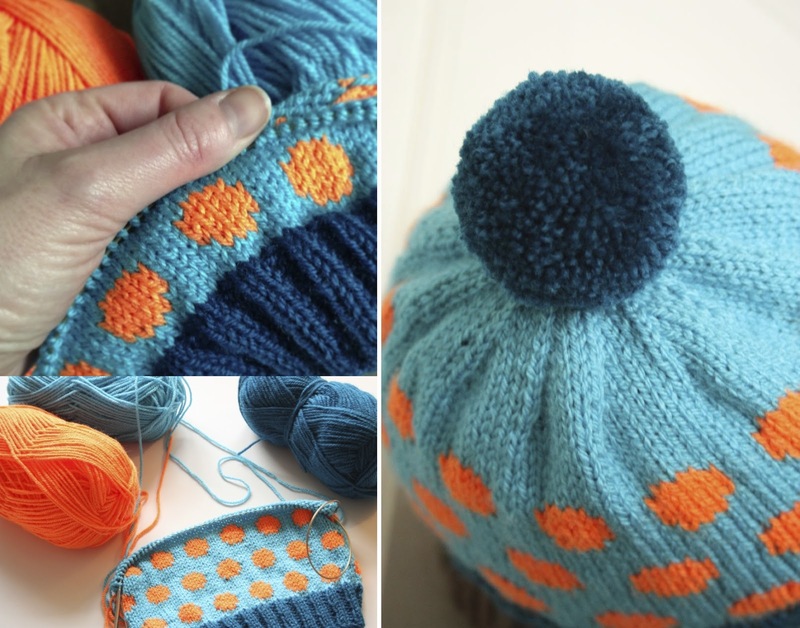 It's a gorgeous, gorgeous hat and I ADORE the colours. So bright & cheerful! Your knitting is so neat it doesn`t look handmade. Well done! 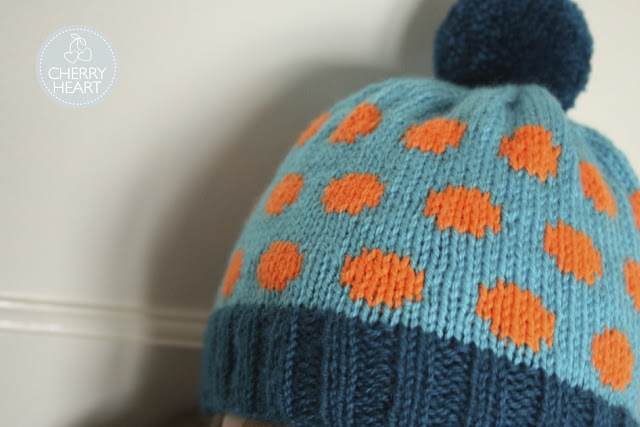 What a lovely eye catching hat, you wont lose him in a crowd! Lovely colours, very nice hat!! Absolutely love the colours - really funky! The style is brilliant too! I ordered that Stylecraft Special in Jaffa, once - I was shopping online and the shop's colours were WAY off - it looked like a nice, gentle, peachy orange. Boy was I surprised when I opened the package! I couldn't think of anything to do with it that wasn't a high-vis vest, so I returned it. However, I will say that it works remarkably well in your very lovely hat!